Global leaders have acknowledged the need to take urgent collective action to combat the illegal wildlife trade (IWT) at the the fourth global conference on IWT. This now needs to be matched by action. LONDON, 12 October 2018 - Global leaders have acknowledged the need to take urgent collective action to combat the illegal wildlife trade (IWT) at the the fourth global conference on IWT. This now needs to be matched by action. Hosted by the UK government in London, the conference emphasised the need to tackle IWT as a serious organised crime, work collaboratively with new partners, and redouble efforts to reduce demand. The essential role of local communities also emerged strongly as a unifying theme. WWF welcomes the renewed commitments to stamp out IWT, but calls on governments to now turn these commitments into concrete action as well committing to protect the landscapes on which the species threatened by IWT depend. Estimated to be worth more than £15 billion a year, the illegal trade in wildlife is devastating some of the world’s most precious animals such as pangolins and plants such as rosewood. Around 55 African elephants are killed a day, driven by poaching for their ivory. The conference saw a number of actors recognise the importance of tackling the financial crimes linked to the illegal wildlife trade, and identifying the beneficiaries of these crimes. One the eve of the conference, 28 global financial institutions signed the Mansion House Declaration as part of United for Wildlife’s Financial Taskforce meeting, committing to collectively put in place effective mechanisms to identify and address suspicious transactions. 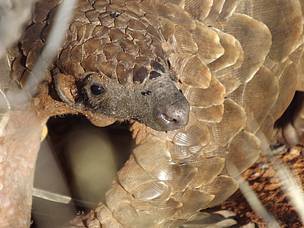 “Too often the illegal wildlife trade is seen as simply an environmental issue. Not only is this a misunderstanding of the nature of the trade, it also limits the entry points for effective enforcement interventions. If we are to stop this devastating trade, we must recognise that it is serious transnational organised crime, facilitated by corruption and financial crime. Strong legal and policy frameworks, and strong institutions are essential, not just for an enforcement response, but also to enable local communities to properly negotiate and obtain tangible benefits from nature. Key to success in addressing wildlife crime will be connecting the strands of enforcement, local communities, incentives, human rights and aspirations, enforcement, anti-corruption, financial crime, and demand reduction. Ahead of the conference, WWF published a survey of wildlife rangers’ working conditions, revealing that preventable diseases such as malaria, a lack of access to clean drinking water and to the most basic of supplies, are undermining rangers’ effort to protect iconic species. “Rangers are nature’s first line in defence against wildlife traffickers. Yet our survey - the largest ever conducted - has revealed a shocking lack in access to basic healthcare, equipment and training.